In response to polls showing her trailing in her re-election campaign, State Senator Carole Migden filed suit on Tuesday to invalidate a voter-approved campaign finance law that she previously had supported. Although Migden voted in favor of placing Prop 34 on California’s 2000 ballot, she now claims the measure she backed unconstitutionally prevents her from spending $647,000 in the Senate race. Prop 34 barred such “intra-candidate transfers” – in which money collected for one race is spent on another. Now that she needs funds, Migden is asking the court to throw out these limits as an unconstitutional violation of free speech. The lawsuit may not play well in a district whose voters support campaign finance reform, and many are likely to be particularly unhappy that while the state faces a massive budget shortfall, Migden’s suit requests that taxpayers pay her attorneys fees. Migden’s lawsuit challenges a campaign finance law that she supported in 2000 and had no problem with until she sought to violate it for her current race. 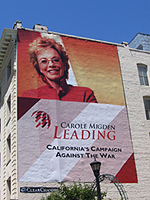 And she chose to spend nearly $400,000 in violation of Prop 34 prior to her decision to challenge its constitutionality. While Migden’s suit is clearly designed to get her badly needed cash, it appears also designed to preempt an anticipated FPPC lawsuit against her for this illegal spending. Now her camp can claim that the FPPC suit is merely a response to Migden’s own suit, rather than an attempt by the state agency to enforce a voter-approved ballot initiative. The San Francisco, Marin and Sonoma residents that comprise State Senate District Three tend to be strongly supportive of the type of campaign finance reform measures that Migden now seeks to invalidate. And district voters are unlikely to appreciate Migden’s request that taxpayers pick up her attorneys’ fees should she prevail, given that her action is motivated by a personal agenda rather than the public interest. FPPC Chair Ross Johnson accused Migden of trying to “bully” the agency, and vowed not to let the lawsuit deter the FPPC’s intent to enforce campaign finance law.